If your mail app keeps refusing to sync your emails, it is probably because Gmail considers it to be a “less secure app”. Instead of syncing your mail, you get warning messages asking you to login by a web browser. You may already have tried to do that, but your mail app still won’t sync with Gmail. Let us tell you what’s going on, and how to resolve this problem once and for all. From July 15, 2014 onwards, Google started promoting OAuth 2.0 over Basic Authentication. Their first step – blocking access to third-party apps that do not support OAuth 2.0. This includes all versions of Microsoft Outlook, even Outlook 2016. This issue also affects other apps like Mozilla Thunderbird, and Apple Mail apps in iOS 6 and older. When these apps try to sync with Gmail, they will be denied access. Instead, you will get a warning message, asking you to login using a web browser. That won’t work though, because logging into your Gmail account using a web browser won’t enable OAuth 2.0 support in your app. It would be technically simple for Microsoft to add OAuth 2.0 support to Outlook, but it appears that they are uninterested in helping improve access to Gmail. Until then, let’s show you how to unblock Gmail restrictions on Outlook and other “less secure apps”. The good news is Google did not block access completely. They still allow Basic Authentication for these “less secure apps” to work with Gmail. 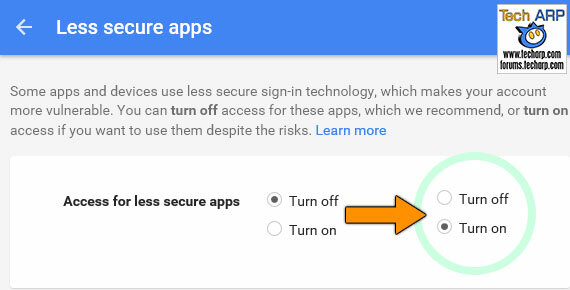 The only thing is you must explicitly enable Basic Authentication via the Allow less secure apps option in Gmail. Whichever method you choose, you will need to replicate for each and every Gmail account you need to sync to Microsoft Outlook, or any app that is considered “less secure” by Gmail.